For those that love the wilderness, Yellowstone National Park represents the embodiment of an inland paradise. For Alana Pulkkinen, recent graduate of Washington County Community College’s Adventure Recreation and Tourism program, the 3,500-square mile park also represents something else: her new office space. A number of factors attracted Pulkkinen to WCCC, including its small class sizes and its emphasis on in-the-field learning. “I’m a hands-on learner, and it helps to be able to participate in activities firsthand that you are learning,” she explained. Once at WCCC, Pulkkinen thrived in the comfortable atmosphere and found the instructors, the staff, and the students to be “very inviting.” As an on-campus resident, she became fast friends with each of her roommates. Pulkkinen readily handled the academic portion of her studies, finding her only challenge to be balancing the four jobs she took on while still being a full-time student. After graduating from WCCC in 2015, Pulkkinen applied to and was accepted into Rangely, Colorado’s Seasonal Law Enforcement Academy. In January 2017, she applied to the National Park Service while still attending the academy. She accepted her first position that May: working as a park ranger at Crater Lake National Park. From there, Pulkkinen applied to Yellowstone, where she now has the official title of Back Country Law Enforcement Ranger. 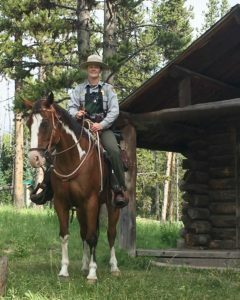 Working as a park ranger for the NPS, Pulkkinen’s duties include trail work, working with stock, checking cabins, handling and verifying fishing permits. She also has the duties of a Front Country Ranger, which include EMS, SAR, Fire response, vehicle stops, assisting visitors, and any other situations that may arise within the park’s boundaries. Pulkkinen strongly feels that her time at WCCC prepared her well for her current responsibilities. “The outdoor skills I acquired from the program were above and beyond and most definitely made me feel more confident in being in the woods and on the water in various situations and climates,” she said, adding that the certifications she attained in the program were an added bonus.